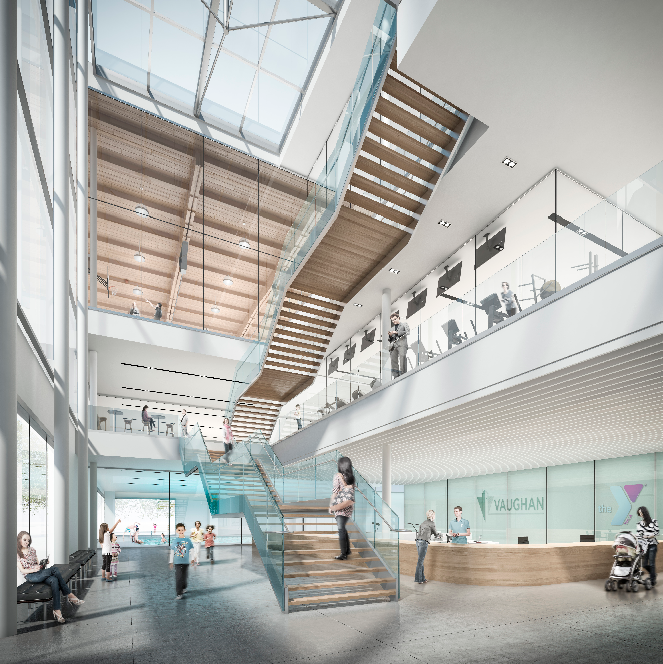 New office building and YMCA / Library in the Vaughan Metropolitan Centre. Will be on part of the current Walmart parking lot, beside the new bus terminal. The rendering from this Vaughan Citizen article is credited to Diamond Schmitt. I would assume they will be the Architect for this project. Its interesting that this new building will be encroaching on the Walmart parking lot. I haven't heard anything about any concrete plans for Walmart to finally move. The walmart parking lot is always half empty anyway so removing a bit of parking shouldn't be an issue. For those fearing the loss of parking, there will be a 6 (!) storey parking garage right behind this building, and is part of the project. Just what a growing urban centre needs... At least bury it. Alas, the project gotten the Cheapening alright. I don't really have an issue with the parking garage, if its purpose is to serve transit users. It can always be torn down later, similar to the Yorkdale TTC garage. I think the garage is for office building parking, not transit. But even if was, the 407 station would be the place for it, not here. I'm really wondering how the images of Vaughan Corporate Centre's future align with reality. I just can't help but wonder, is the Walmart, along with other buildings in the area moving or staying? What about all the buildings that already exist? It seems to me that the images of this future area are not 100% accurate. For example look at this image of buildings where Wal-Mart exists and Rona. Do we just assume that these buildings will magically vanish? They will eventually be removed, but Calloway REIT will presumably develop the rest of the current empty lands first. Big box retail structures aren't designed to last either - developers usually plan them with 30 year lifespans to make their money, any extra life after that is a "bonus". 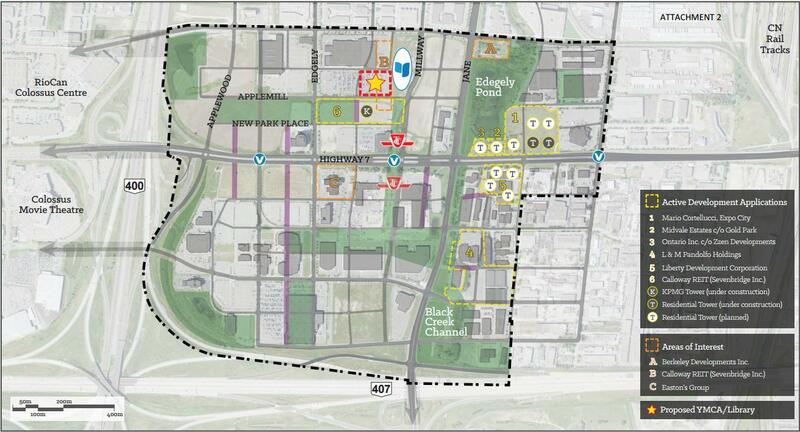 The Walmart et al were built in the early 2000's, which means the late 2020's or early 2030's for redevelopment. The building this thread is the subject of is already eating away at the Walmart parking lot - they will eventually be torn down. Does this have a thread already? 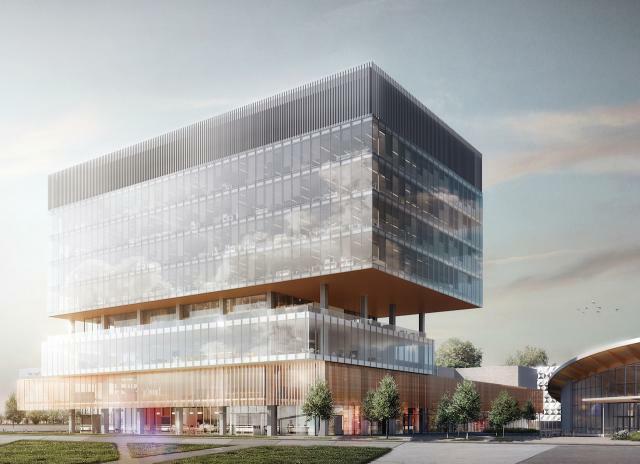 SmartREIT and partner Mitchell Goldhar this week unveiled plans for a new 220k SF Class-A office tower at Vaughan Metropolitan Centre that’ll have PwC Canada as its anchor. VMC, a new downtown for Vaughan at Highways 400 and 7, will be a 40M SF development centred around new mass transit, including a subway connecting directly to downtown Toronto. The PwC tower will be adjacent to the 360k SF KPMG office tower (above), opening in October. The new office tower also will be home to a 100k SF flagship YMCA with childcare, fitness and aquatic facilities, plus a 20k SF City of Vaughan library and studio space. SmartREIT VMC is Canada's largest urban mixed-use development, noted SmartREIT CEO Huw Thomas, whose firm owns 53 acres of developable land around the subway station in a 50/50 JV with Mitchell, SmartREIT’s chair and largest unit holder. The partners plan to develop 8M to 10M SF of commercial, residential and retail there as part of a 100-acre master planned project (the remainder of the land is owned by Mitchell in partnership with others). The VMC ultimately will have 17M SF of mixed-use space and a nine-acre park. The subway station, the GTA’s most northerly, opens in late 2017.
also looks like PwC is going to anchor this building. A bit of a financial / accounting hub setting up in VMC now with both PwC and KPMG. SmartREIT and partner Mitchell Goldhar this week unveiled plans for a new 220k SF Class-A office tower at Vaughan Metropolitan Centre that’ll have PwC Canada as its anchor. VMC, a new downtown for Vaughan at Highways 400 and 7, will be a 40M SF development centred around new mass transit, including a subway connecting directly to downtown Toronto. The PwC tower will be adjacent to the 360k SF KPMG office tower (above), opening in October. 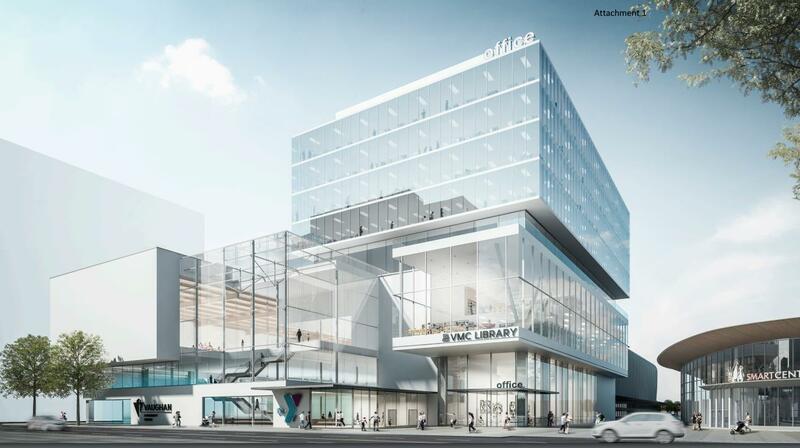 The new office tower also will be home to a 100k SF flagship YMCA with childcare, fitness and aquatic facilities, plus a 20k SF City of Vaughan library and studio space. Yup, my understanding is our York Mills offices plus some satellite downtown ones are moving up there.